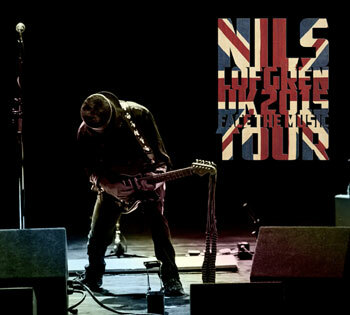 Long known for his stellar live performances, Nils Lofgren brought his Acoustic Duo shows back to the UK to great fan reception in 2015; this disc captures the magic of that tour, with 14 tracks recorded live. Inspired by his recent career-spanning Face the Music box set, song selections range from the Grin years ("Like Rain," "Rusty Gun") to the very recent "Miss You 'C'," from obscurities to perennial faves. In January 2015, after a three-year break from our traditional acoustic UK tours, we headed back in the dead of Winter, excited for another run of shows, town to town, on the bus, sharing music that hopefully spreads some good will and hope to linger with the wonderful audiences we've had, decade after decade. Accompanied by Greg Varlotta, our friend and amazing, multi-instrumentalist and our stellar crew, we all set out to do special, inspired shows everywhere. We were all thrilled with the audience response and it was Amy who insisted we record the last half of the tour, optimistic it could lead to an album of live tracks to commemorate this wonderful UK run. She was right and here it is. We hope you all enjoy it. It really is the audience that breathes the life, fire and inspiration into every performance. God bless you all and thanks again for your presence and magical energy, night after night, town after town, note after note.